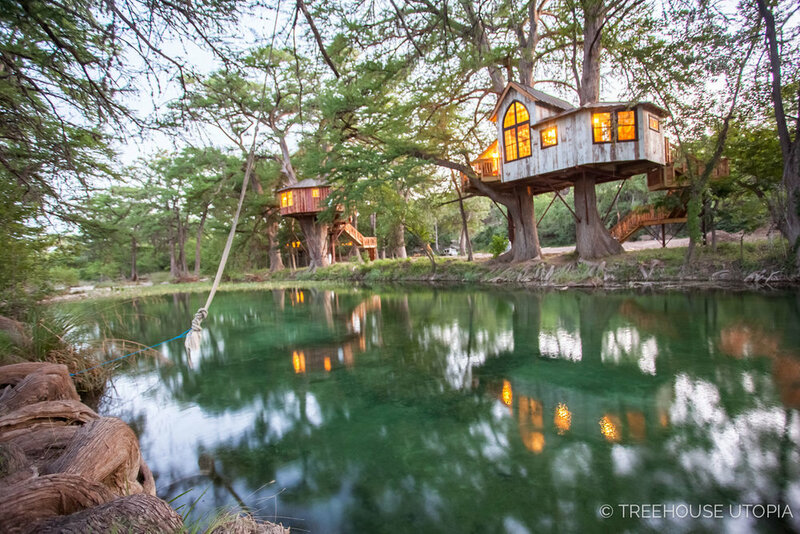 Updates on Treehouse Utopia, a Texas Hill Country retreat opening summer 2018. January-June 2019 dates opened up in November 2018. July-December 2019 dates will open up in May 2019. 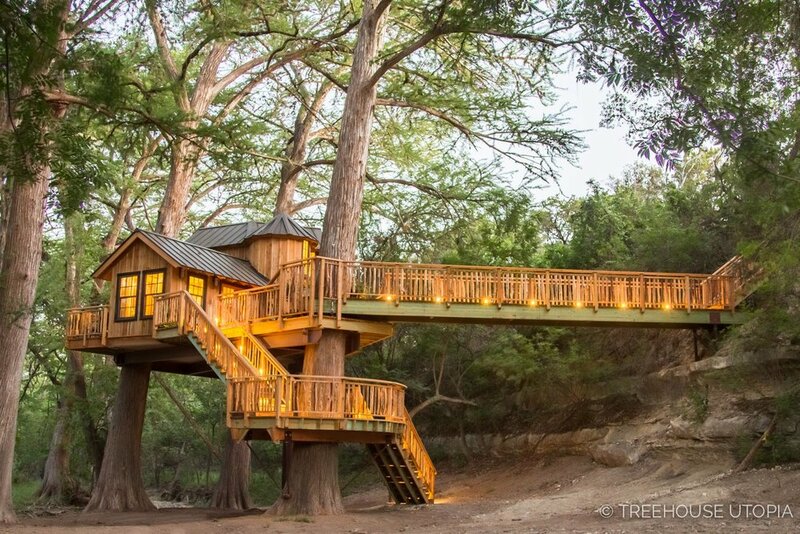 Treehouse Utopia in Texas Hill Country is the outcome of a partnership between Pete Nelson and Laurel Waters, chef and owner of The Laurel Tree Restaurant. With its four rentable, private treehouses and natural splendor, this romantic retreat exudes magic. 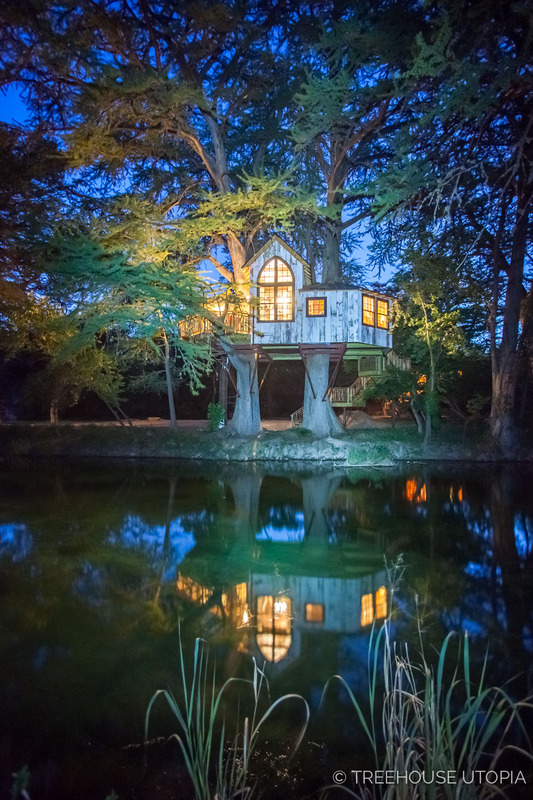 Treehouse Utopia truly lives up to its name, with sweeping views of the Sabinal River, prehistorically sized trees, and the starlit sky that stretches over Hill Country. 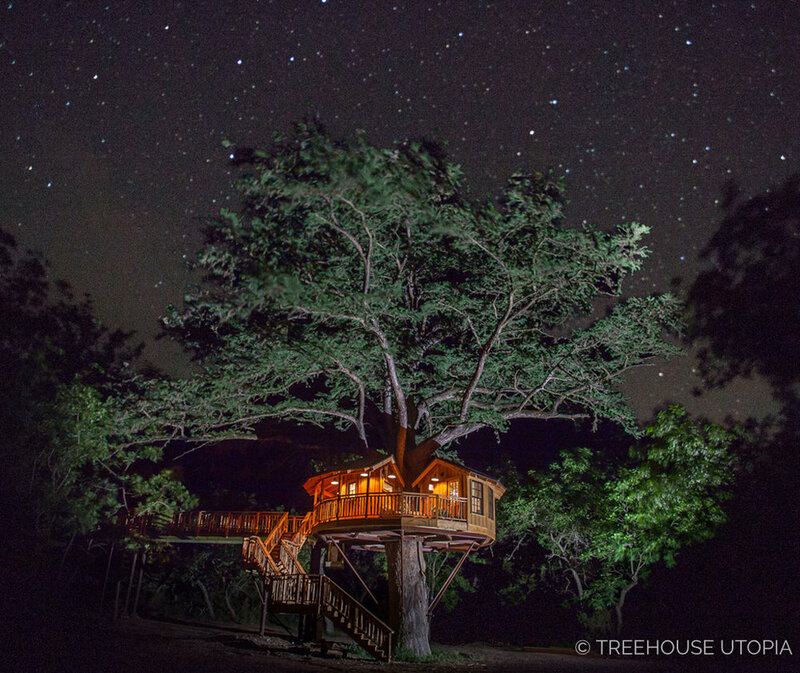 Find answers to FAQ about Treehouse Utopia in this blog post. To book your stay in the trees, visit treehouseutopia.com. 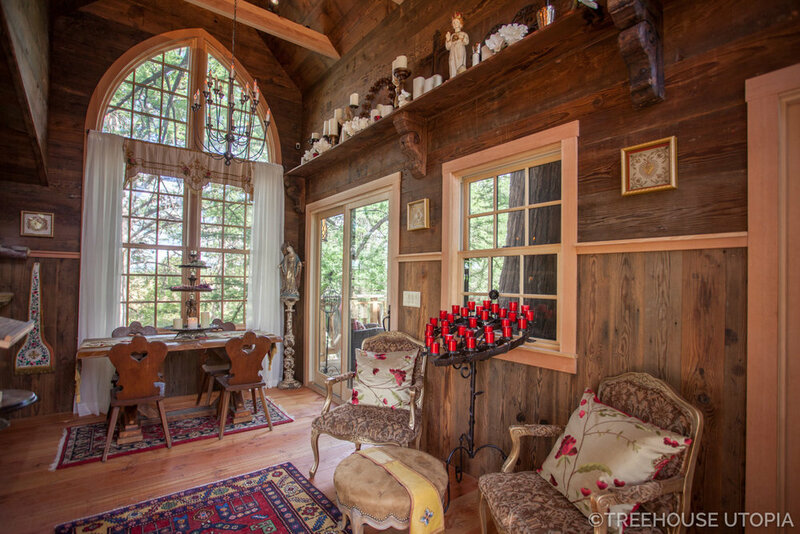 Treehouse Utopia has four luxury treehouses: Chapelle, Chateau, Carousel, and Biblioteque. All are supported by magnificent cypress trees. The treehouses range from 400 to 580 square feet and come with most amenities of a modern hotel stay, including electric lighting, hot and cold running water, heating and air conditioning, toilets, tiled showers, and high-speed WiFi. 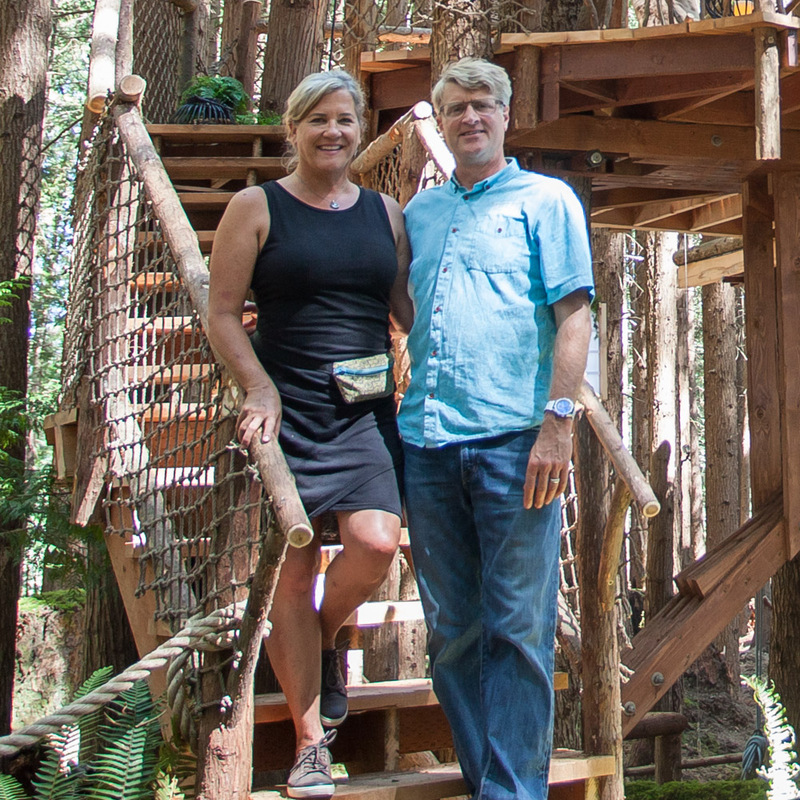 With their prodigious scope and artful architecture, these four represent the culmination of Pete's 30 years of experience designing and building the most fantastical treehouses around the world. The treehouses' French names come from Laurel Waters’ love of France. Laurel studied cuisine at Le Cordon Bleu in Paris, worked in fine dining restaurants in Provence, and personally collected French antiques for the interiors of the treehouses. Each treehouse has a distinct character; read on for an overview. Chapelle is divine, with soaring ceilings and twin Gothic windows overlooking sunrise and sunset. Its enormous bathroom, complete with a clawfoot tub and tiled shower, is a spa-like sanctuary. You can take our photo tour of Chapelle, here. Chateau is grand and opulent. Its two stories hold an ample deck, sitting room, bathroom, and winding turret to a decadent bedroom loft. You can take our photo tour of Chateau, here. Carousel is whimsical, with bright colors and one-of-a-kind furnishings, including a chandelier made from a vintage carousel horse. Its riverside position offers stunning views of the turqoise waters below. You can take our photo tour of Carousel, here. Biblioteque wraps around a single cypress tree. It's designed like a cozy library, with walls of built-in bookcases and ultra-comfy reading nooks.